The DNA origami technique can enable functionalization of inorganic structures for single-molecule electric current recordings. Experiments have shown that several layers of DNA molecules, a DNA origami plate, placed on top of a solid-state nanopore is permeable to ions. Here, we report a comprehensive characterization of the ionic conductivity of DNA origami plates by means of all-atom molecular dynamics (MD) simulations and nanocapillary electric current recordings. Using the MD method, we characterize the ionic conductivity of several origami constructs, revealing the local distribution of ions, the distribution of the electrostatic potential and contribution of different molecular species to the current. The simulations determine the dependence of the ionic conductivity on the applied voltage, the number of DNA layers, the nucleotide content and the lattice type of the plates. We demonstrate that increasing the concentration of Mg2+ ions makes the origami plates more compact, reducing their conductivity. The conductance of a DNA origami plate on top of a solid-state nanopore is determined by the two competing effects: bending of the DNA origami plate that reduces the current and separation of the DNA origami layers that increases the current. The latter is produced by the electro-osmotic flow and is reversible at the time scale of a hundred nanoseconds. The conductance of a DNA origami object is found to depend on its orientation, reaching maximum when the electric field aligns with the direction of the DNA helices. Our work demonstrates feasibility of programming the electrical properties of a self-assembled nanoscale object using DNA. Molecular dynamic simulations of ionic current through a DNA origami plate. The scaffold and staple strands of the plate are shown in blue and yellow, respectively; Mg2+, Cl- and K+ ions are shown as pink, cyan and ochre spheres, respectively. Water molecules forming magnesium hexahydrate complexes with Mg2+ are explicitly shown in red (oxygen) and white (hydrogen). The movie illustrates a 48 ns MD trajectory of the system at a 100 mV applied potential. The bulk concentrations of KCl and MgCl2 are 1 M and 50 mM, respectively. For clarity, only 10% of the ions are explicitly shown. 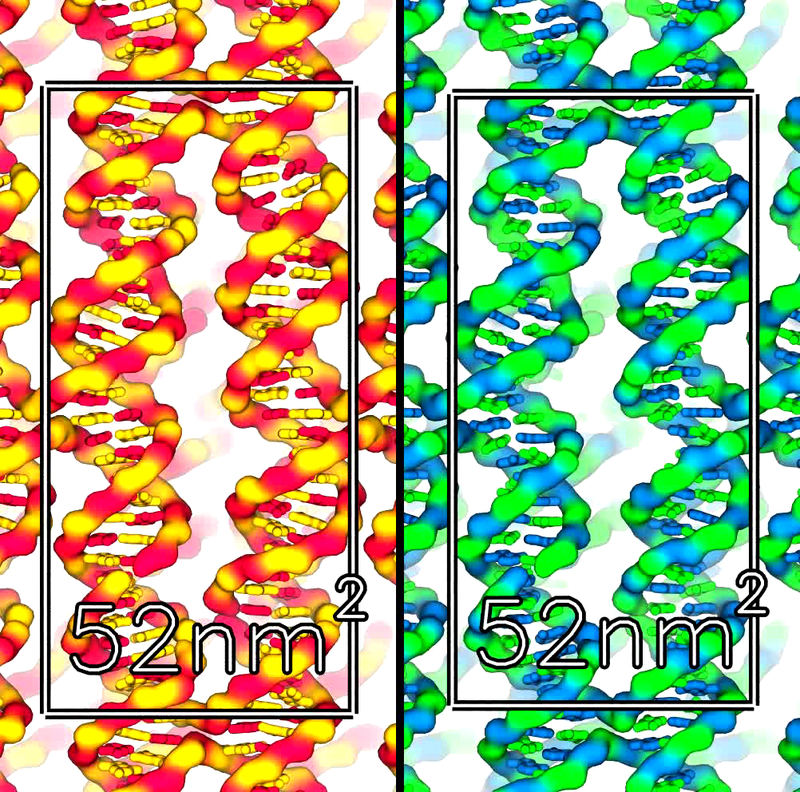 Structural dynamics and cross section area fluctuation of the CG (left) / AT (right) DNA origami square lattice plate. Cytosine (C), guanine (G), adenine (A) and thymine (T) nucleotides of the plate are shown in red, yellow, blue and green, respectively; water and ions are not shown. Several periodic images of the cell are shown. The rectangular box indicates the boundary of the unit cell; the instantaneous area is reported in units of nm2. The movie illustrates a 573 (left) / 947 (right) ns equilibration (zero applied bias) of the system at 1 M KCl / 250 mM MgCl2 bulk ion concentration. 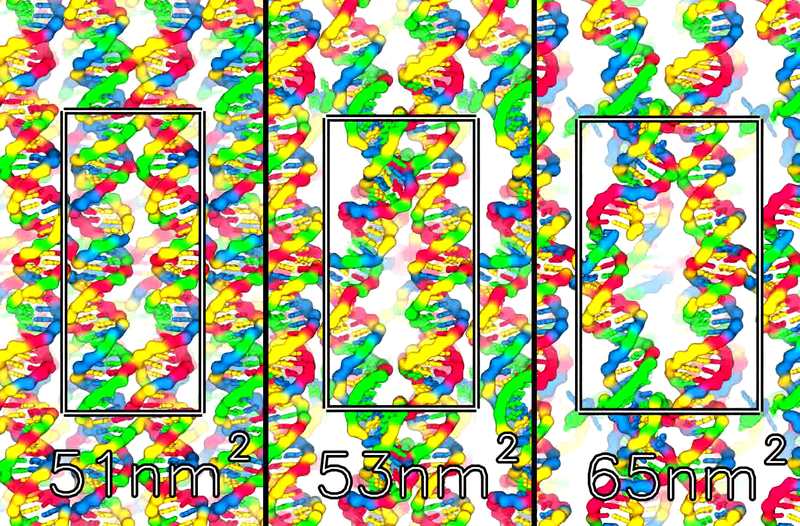 Reversible deformation of a two-layer DNA origami square lattice plate by electric field. The two layers of the plate are shown in yellow and blue. The arrow indicates application of external electric field corresponding to a 500 mV bias. The instantaneous distance between the scaffold strand in the top and bottom layers of the plate is reported in units of Å. The movie illustrates a 230 ns trajectory of the system at 1 M / 250 mM bulk concentration of KCl / MgCl2. 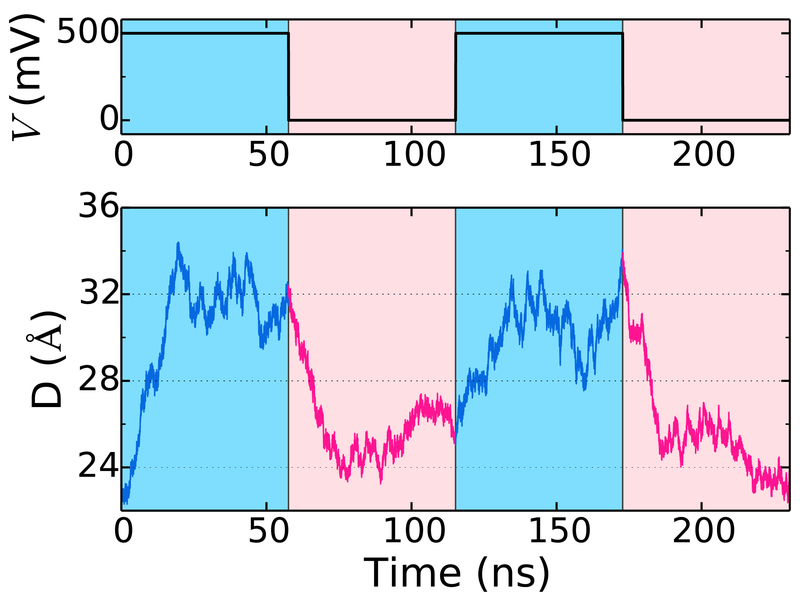 The plot shows the time trace of the distance between the scaffold strands in the top and bottom layer and the corresponding bias. 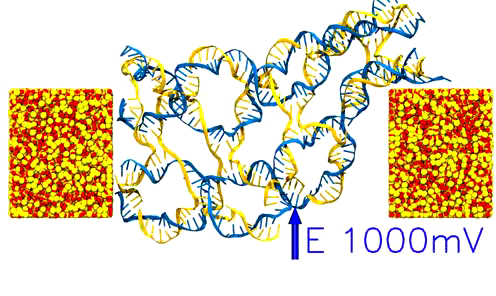 Electric field induced deformation of a DNA origami plate on top of a SiO2 nanogap. The DNA origami is shown using cyan, green and red lines, SiO2 as red (O) and yellow (Si) spheres; water and ions are not shown. The movie illustrates a 101 ns MD trajectory of the system at a 100 mV (cyan), 250 (green) mV and 500 mV (red) applied potential and 1 M / 50 mM bulk concentration of KCl / MgCl2. Electric field induced deformation of a DNA origami plate on top of a SiO2 nanogap. The scaffold and staple strands of the origami are shown as blue and yellow lines, respectively. 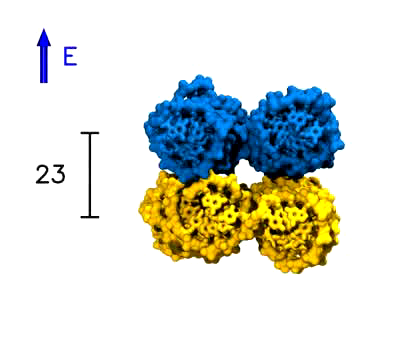 SiO2 is shown as red (O) and yellow (Si) spheres; water and ions are not shown. The movie illustrates a 34 ns MD trajectory of the system at a 1000 mV applied potential and 1 M / 50 mM bulk concentration of KCl / MgCl2.